The book was good, exciting to read and good description in every aspect of the story. I enjoy Zane Grey, Max Brand, Brock & Bodie Thoene and Louis L'amour stories but I don't care for the language style of Larry McMurtry. It was my first book by him and I only made it part way. May have been a good story, I don't know. I simly prefer books with claen language. That is why I prefer old movies to new also. To each there own. about a year ago, i picked up "By Sorrow's River" not realizing it was the third in a series, just seeing that it was by Larry McMurtry. i was intending to read the first two books, but didn't get around to it. then i listened to them on audiobooks, and the reader is so thoroughly WONDERFUL that now i would rather hear "By Sorrow's River" read by this narrator than read it for myself! the writing is, of course, pure McMurtry, by turns hilarious, engaging, entertaining, thoughtful and downright silly. love it. 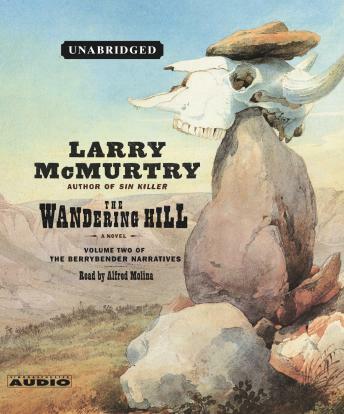 I got the Telegraph girl for christmas, Enjoyed it so much I wanted to do the Berrybender saga by McMurty, The Wandering hill Book 2 is very good, lots of action, lot of stories within a story, the old west with all the hardships. and even some funnyparts too. I enjoyed this book well enough. It is the second book in the series and it's interesting to see what's going to happen next. The first book starts out with so many characters and now I see why. People die left and right and in strange ways too. I still don't quite get the the significance of the Wandering Hill yet. But maybe they will explain that more in the next book which I fully intend to read. It's not the best book I have ever listened to but it wasn't a waste of time either. I wouldn't bother though if you do not intend to read all the books because they are very open ended. This book is well worth the read. I enjoyed reading it because it is different from the norm. I would recommend it to anyone. McMurtry is a great storyteller and has the ability to take you into characters and situations of the 1830's western frontier. He has incorporated artist George Caitlin into the scenes of this story and that just makes it all the more fun. Take a look at some of Caitlin's many works of art to appreciate how he lived and accomplished his artistry. This is the second of McMurtry's series starring the tedious, cloying,silly Berrybender family. I read the last one first; so I can save you the trouble. McMurtry bombs with this series. Save yourself the time, trouble, and energy; read Lonesome Dove again instead. Great characters; great story. Always unpredictable, and in no hurry to go anywhere. No great beginning or end point, but you won't require one.